Our excitement builds as students from an elementary school in Bristol, Virginia share pen pal letters with students attending the Learning Center in Costa Rica. The exchange of letters has all the students involved excited as they engage in this international project. Recently, the students at the Learning Center in Copey received letters prepared by two groups of American students. One group represents students attending Lisa Baldwin’s class of 5th graders. The other group are students attending a Summer Scholars program at Emory & Henry College in Emory, Virginia with Lisa leading one of the classes. 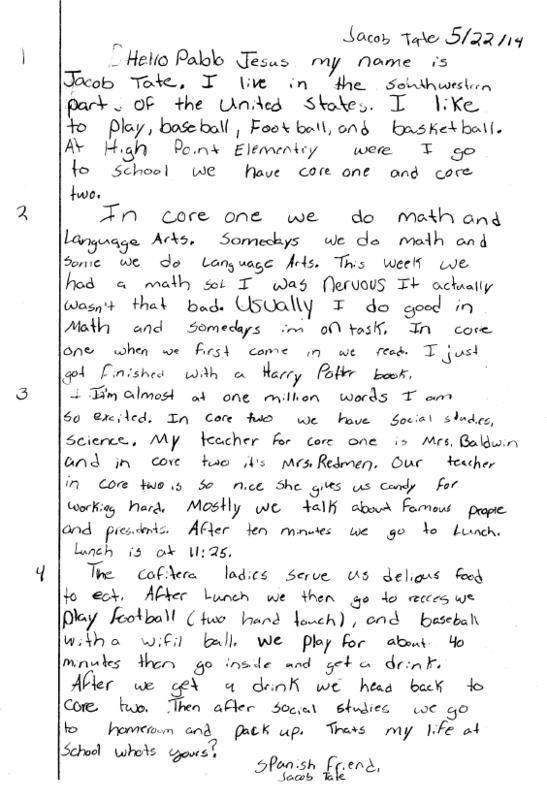 It is extraordinary to have such young students communicating between two countries and it goes far beyond elementary students writing each other. The Pen Pal project opens the international door for the teachers to share information. In short, the potential educational impact is great! Much of our excitement is due to Lisa’s involvement. She is a veteran teacher with outstanding credentials. She was the 2005-06 Teacher of the Year, Cove Creek School, Vilas, NC, and the 2005-06 Watauga County Wal-Mart Teacher of the Year. In 2007 she was inducted into the Delta Kappa Gamma Teachers’ Society International. 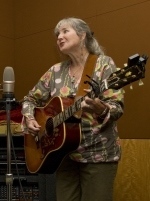 Since 1984 she has been a professional musician and songwriter, performing folk, country, bluegrass, and original music. She has led workshops for public school teachers, librarians, and child care providers, and she has participated in numerous grants. She has successfully blended her classroom teaching with her other passion for singing and songwriting. There is the promise of bringing both talents as teacher and entertainer to the students at the Learning Center. Lisa has already begun to interact with the leadership at the Learning Center and we foresee an educationally rich and rewarding experience for all involved, including the “Friends of Copey”. Other potential forms of interaction between the students may include the use of real time communications using technology such as Skype. This technology allows students and teachers on both ends to have visual contact as they communicate. Lisa hopes to introduce her very successful musical educational program known as “Music, Minds, and Motion” (http://musicmindsandmotion.com). The program engages students in musical activity designed to educate students. 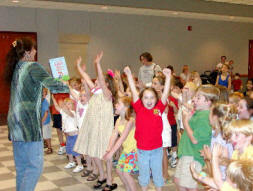 She has presented her interactive music, reading, and movement program at schools, libraries, child development centers, festivals, and senior centers in Alabama, Georgia, Florida, North Carolina, and Virginia. She has been a K-8 classroom teacher since 1978 and certified in Alabama, North Carolina, and Virginia. 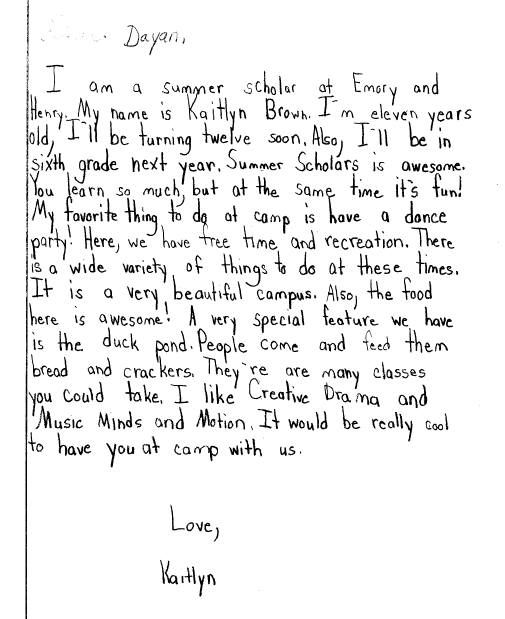 This letter is one of several from the elementary school in Bristol, Virginia sent to a pen pal at the Learning Center. The pen pal at the Learning Center will respond with a letter soon. We are looking forward to the students exchanging a minimum of three letters this year. Under Lisa’s guidance, another group of letters were sent to the Learning Center authored by a few of the students attending the Summer Scholars Program at Emory & Henry College this summer. The Emory & Henry Summer Scholars program is a one-week residential academic program for rising middle and high school students inclined toward academic adventure. For rising 6th – 9th graders, the traditional Summer Scholars program offers a unique mix of learning activities designed to broaden academic interests and expose students to a college-like setting. I will post letters from the Learning Center students when they become available. Also, updates will be provided on other Pen Pal projects as they develop. Finally, the Learning Center reports they could use some school supplies to assist in getting through the balance of their school year. If any of the “Friends of Copey” feel inclined to make a small donation, please do one of two things. Regardless, keep the Learning Center in your thoughts and prayers and my heartfelt thanks are extended to all for being “Friends of Copey”.